Brainstorm your image of cattle droving and outback cattle country. What is your overall image? Play the video clip extract with no sound. What image or message is being presented? Now play the video clip with the sound on. How do the drovers in the clip react or respond to the country and their job? 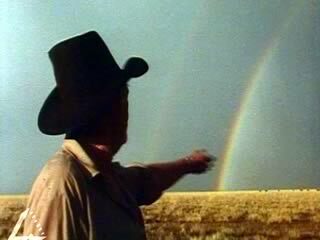 Create a list of words that summarise the image of the outback cattle country presented in the video clip. What is the overall image? Compare this to your perceptions as recorded in the brainstorm and discuss the similarities and differences. For example, do you think that your image of the country is harsher than theirs? Or that you do not stress the beauty like they do? If your images are similar, try and explain why. If they are different, try and explain why that is. The filmmaker stresses an image of great beauty. How is this image created? Consider such elements as the narration and the interviews, music, the types of film shots presented, the lighting. Look at each as it is presented in the video clip. Draw up a table summarising the strengths and limitations of each for communicating ideas and emotions effectively. Which do you find the most effective in the clip? Why? Imagine that you have been asked to create filmic impression of droving in outback cattle country. You only have the images presented in the video clip — but you can change the narration and change what is said in the interviews. Create an outline of a script that will achieve this.